Farming Simulator 18 for Android is a farming simulation app where you can grow crops and more crops. It is a treasure trove of immense possibilities. Similar to other games of this genre, you will be given a plot of land and equipment to help you sow seeds. Plant crops to get money or grow a forest. Not just crops, you can also breed livestock like cows, goats and pigs. As you harvest and reap produces, you need to transfer them to the city and sell it for money. With Farming Simulator 18 for Android you are actually making more money to spend more on stuffs you need to make more money again. You will spend hours in the vicious cycle. You will become a part of modern farming community to harvest diverse crops and take care of, cows, goats, sheep and pigs. 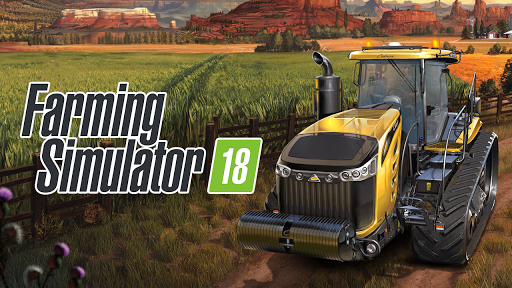 To aid your farming skills, Farming Simulator 18 app has over 50 farming equipment that is from reputed 30 big names of equipment manufacturers. Tractors, trucks, pre installed front loaders are all realistically powerful and pretty handy. You get to harvest 6 varieties of crops, wheat, canola, corn, sugar beet, potatoes and sunflower. As you attend to your crops and animals, you will be given additional tasks to earn bonus points. Tasks pop up whenever it is completely optional, you can take it up whenever you want to break free. Sell pigs, milk and cotton for profit. Front loader attachments transport bales, wood and feeds. 3D graphics show more details about the machinery. Turn on Wi-Fi and play with friends in a multiplayer mode. Farming Simulator 18 for Android is a simpler form of farming simulation app that actually makes you feel better and not overwhelmed. The landscape is inspired by American towns with mix of grasslands, rocky patches, desert and oasis. So, it is actually a visual treat for the players. You will not find multiple maps like those in other farming simulation apps. The app costs just $1.49 to download and has a few in-app products ranging from $0.28 to $1.